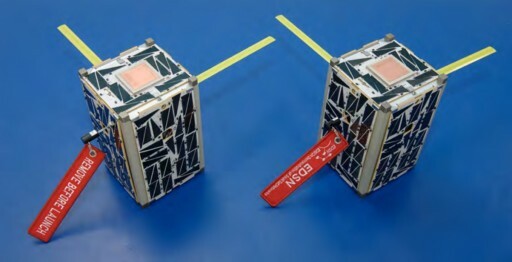 The two Nodes satellites to be deployed from ISS are an extension of the Edison Demonstration of Smallsat Networks (EDSN) which was a swarm of eight satellites planned to demonstrate a networking architecture for the simplification of the operation of large groups of small satellites and paving the way to multi-satellite constellations making multi-point measurements of atmospheric conditions or other parameters that require spatially resolved measurements. 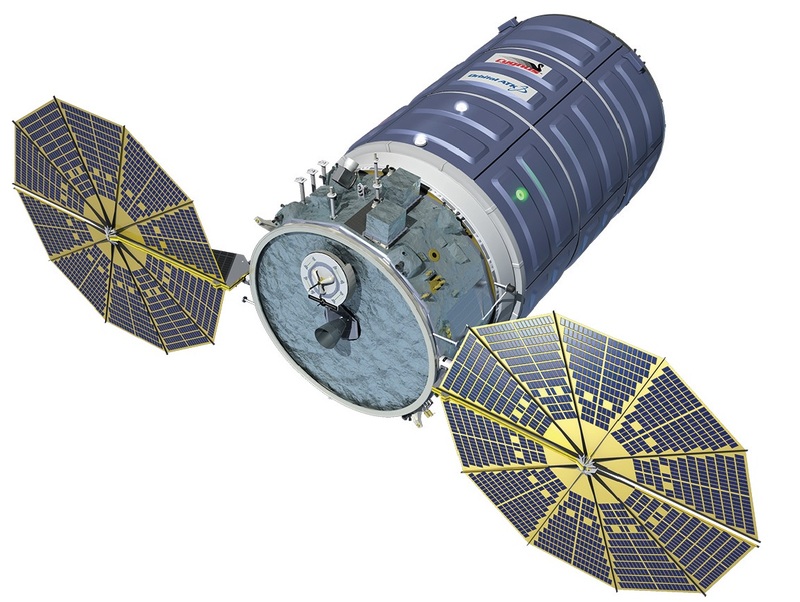 Unfortunately, the original EDSN satellite constellation was lost in the failure of the inaugural launch of the Super Strypi launch vehicle in 2015, leaving only the two Nodes satellites to complete some of the objectives of the original mission. EDSN, the Edison Demonstration of SmallSat Networks, comprises a loose formation of small satellites to demonstrate solutions for SmallSat projects to enable a wide array of future applications in science, commercial, educational and defense space systems. The EDSN project aims to demonstrate cross-satellite data communications for flexible data correlation and distribution as well as simplified satellite operations and data downlink. 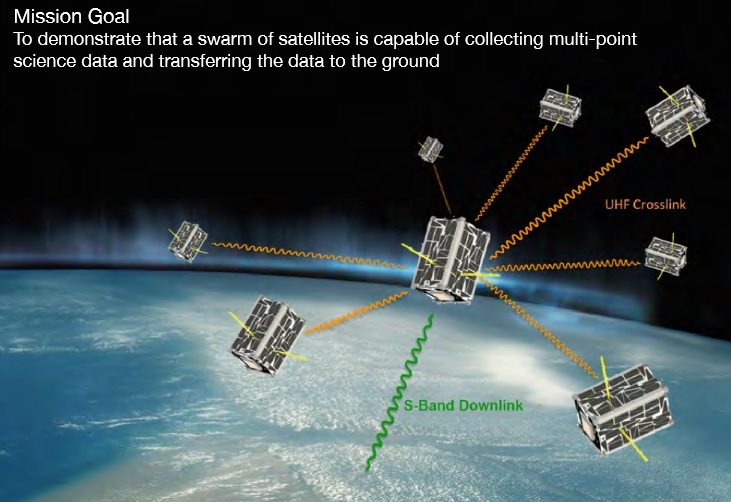 Being a constellation of satellites outfitted with space weather sensors, EDSN can deliver spatially and temporarily correlated data sets that can not be acquired from single satellite missions. The first batch of eight EDSN satellites were developed at NASA’s Ames Research Center and are based on a 1.5U CubeSat platform provided by Pumpkin Inc. The project was initiated by NASA’s Office of the Chief Technologist and is operated under the Small Spacecraft Technology Program within the NASA Space Technology Mission Directorate. The goal of EDSN is to demonstrate space-to-space data transfer from at least two satellites to a third satellite which then transfers the data to the ground. Furthermore, the EDSN satellites will gather multi-point space weather measurements to contribute a unique set of scientific data only possible through the use of a swarm of satellites. EDSN demonstrates a small-satellite reaction wheel system for attitude control and targets to validate a range of Commercial Off The Shelf components for operational in-space lifetimes of 60 days. All eight EDSN satellites are identical, outfitted with low-cost components and based on the PhoneSat 2.0 satellite platform featuring a Nexus S smartphone to test open-source and custom software to create a variable Command and Data Handling architecture. For simplification, the EDSN satellites use a single transceiver for space-to-space and space-to-ground communications. 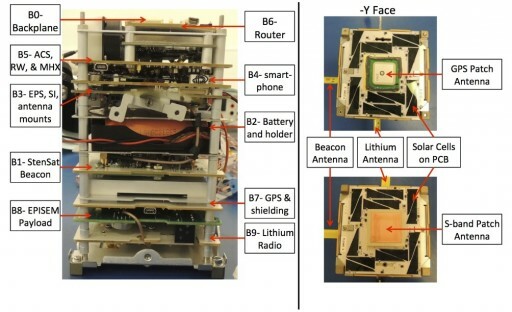 The single payload hosted on each satellite is known as EPISEM – Energetic Particle Integrating Space Environment Monitor, developed at Montana State University. 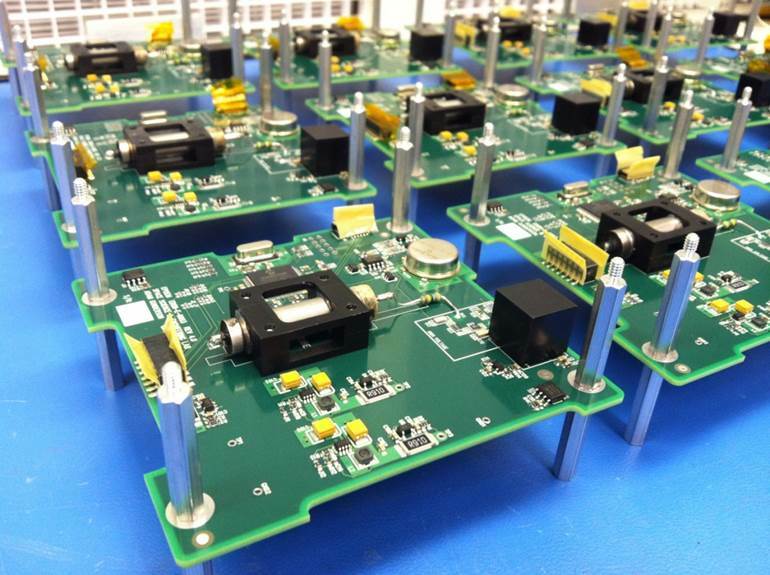 Each EDSN satellite measures 10 by 10 by 17 centimeters in size, conforming with the 1.5U CubeSat form factor. The satellite mass is approximately 1.7 Kilograms. The structural system consists of an aluminum chassis with solar panels clamped to its exterior. Within the structure, four rods run along the length of the satellite, outfitted with spacers to hold a total of eight electronics boards, connected through a backplane. The brain of the satellite is a Samsung Nexus S – fulfilling all tasks of a main spacecraft controller from attitude determination and control to orbit propagation, mission planning, data handling, command execution and telemetry conditioning. The phone is also in charge of the inter-satellite communications system and four Arduino processors manage the GPS receiver, the science payload, sensors, and interfaces as well as the control hardware. The data system uses a data packet system with acknowledgement messages and a prioritization system for critical data packets. Six solar panels are used for power generation, installed on the exterior panels of the satellite and using Triangular Advanced Solar Cells to generate an average power of approximately one Watt. Power is stored in four Li-Ion batteries with a total capacity of 5.2 Amp-hours. The Electrical Power System uses an Arduino processor to complete all power regulation functions and to act as a watchdog. Because of the low power budget of the satellite, the smartphone can not be kept running at all times – therefore, the watchdog is in charge of commanding the phone to power on and off based on event tables that can be uplinked to the satellite. The system also acts as a safeguard, monitoring the bus voltage and switching off systems when the voltage drops below 8 V.
The EDSN satellites feature an active attitude control system consisting of three reaction wheels and torque rods that are actuated based on attitude measurements by the the gyro of the smartphone and magnetometer sensors as well as currents from the solar panels that can be used to calculate the solar vector. The satellite can operate in two attitude modes – a magnetic control mode, primarily used during the de-tumble after release into orbit. This mode makes use of the smartphone magnetometer and the magnetic torquers to align the CubeSat with the local magnetic field. During sun-pointing operations and normal mission operations, the angular rate sensors and solar panel currents will be used to provide information for the actuation of the reaction wheels. The EDSN satellites include three different radio communication systems – one dedicated to the Intersatellite Communications Experiment, one for S-Band communications with the ground and an UHF system to deliver status telemetry. The Intersatellite Communications System makes use of an AstroDev Lithium 1-Watt transmit power UHF Transceiver using the AX25 protocol for a data rate of 9.6kbit/s. 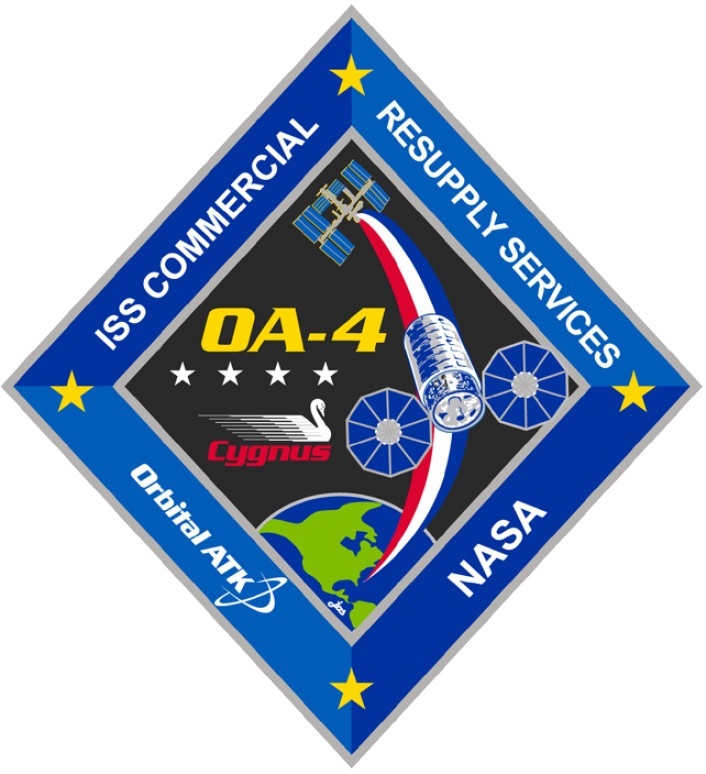 In architecture, the Intersatellite Comm System will use one of the satellites in a Captain role, collecting data from the other satellites, in this case referred to as Lieutenants. This way, one satellite collects all science data from the swarm of satellites for downlink to the ground for an overall reduction of complexity in the support of swarm satellite missions. The Captain role can be rotated between the satellites and the communications network requires no action from the ground as all satellites operate on a programmed set of rules, not needing direction from ground systems. For a transaction – that is the exchange of data from Lieutenant (LT) to Captain (CPT) – the CPT sends out a ping message with the omni-directional UHF antenna. Because the ping is received by all LTs, information contained in the ping specifies the identification of the LT that should respond. To ensure all satellites receive the ping, the CPT sends six pings over a period of 50 seconds. Responding to the CPT, the LT will send one State-of-Health data packet before transmitting all of its science data stored in the crosslink queue. When the LT has sent all its data, it ends to comm session and frees the CPT up to send a series of pings to the next satellite in line. It should be noted, that – for simplicity – no acknowledge or negative acknowledge messages are part of a transaction – if a data packet is not received by the CPT, it is lost. The Nexus S spacecraft controller on the Captain is in charge of building a download stack containing all data packets from a particular LT. For each LT, there is one download stack on the CPT plus one for itself. A normal transaction takes four minutes and all seven transaction are collectively referred to as a session. Because all comm activities are based on time-tagged commands, an accurate time has to be onboard each spacecraft. The master clock of each spacecraft is the Nexus S phone which is corrected once every 25 hours through a GPS fix. Over the course of the cycle, the local time could drift by up to 12 seconds which requires every activity to include time buffers to account for the worst possible clock offset in between the satellites. 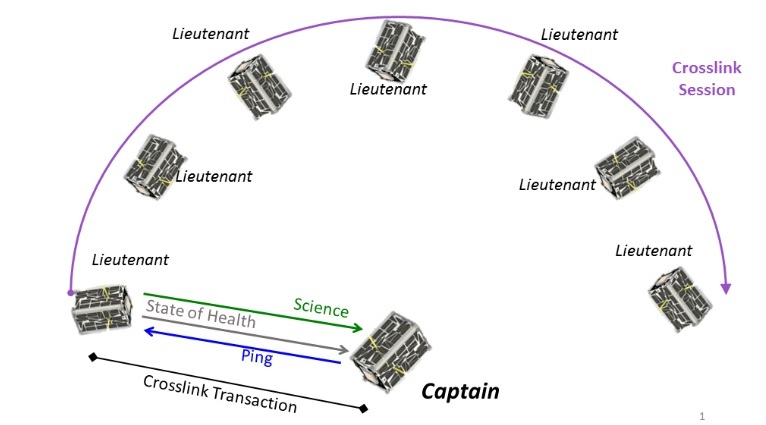 The EDSN Intersatellite Comm Architecture can be considered the most basic system with many enhancements possible in future missions such as a negotiation between spacecraft of the Captain role based on resources available on the satellites, a data transaction with more hops if not all satellites of the swarm are within reach of each other, a better time synchronization system, using multiple Captains and ground stations, routing commands through the network of satellites, etc. 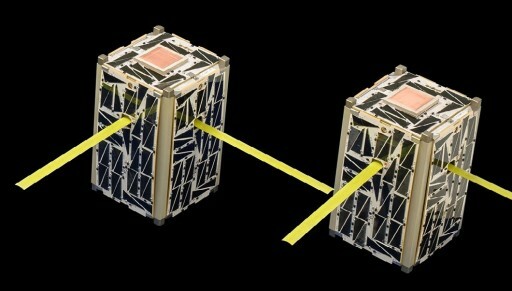 All EDSN satellites carry an identical payload known as EPISEM – Energetic Particle Integrating Space Environment Monitor, a system that can monitor the spatial and temporal variations in space radiation when used by multiple spacecraft of a constellation. These high-density, multi-point measurements are needed for the improvement of models of the Earth’s radiation environment because of the great variability in the ionosphere and radiation belts. EPISEM was developed at Montana State University and consists of a Geiger-Müller tube to measure penetrating radiation. Time and location correlation is accomplished through GPS fixes which will permit the characterization of the spatial and temporal variability of high-energy protons and penetrating electrons. These measurements can also be correlated with radiation-related upsets on the EDSN satellites or other spacecraft. EDSN data will be used to generate a worldwide low-altitude radiation map. EPISEM is filled with Neon Gas that, when hit by high-energy electrons, protons or X-ray photons, generates ions. The number of generated ions and electrons depends on the energy of the incoming particle. Once ions and electrons are present, they begin to drift towards the cathode and anode, respectively. In the anode region, the field strength becomes strong enough to generate Townsend discharges in which the acceleration of the free electrons in the electric field give rise to electrical conduction in a gas through avalanche multiplication generated by the impacts of electrons and gas molecules. This multiplication effect is used as a built-in amplification process to generate a signal strong enough for detection. The total ion current that is measured is proportional to the energy of the incident particle.